INTRODUCTION: LSG is emerging as a definitive procedure for treatment of morbid obesity. It can be valid alternative when gastric bypass or adjaustable banding are contraindicated. OBJECTIVE: A retrospective review of LSG performed in 2008- 2009 was aimed to assess indications, safety and efficacy. METHODS: A total of 50 LSG were performed using 5-6 port technique using the Endo-GIA stapler( Covidien USA with suture line reinforcement with Peristrips) to create a lesser curve gastric tube over a 32-40 bougie. Operative time, complication rates, hospital length of stay, Body Mass Index (BMI), % of Excess Weight Loss (EWL) were evaluated. DISCUSSIONS/RESULTS:. There were 35 Female and 15 Males with mean age of 48 y (range 22-68) and preoperative BMI of 47.56 (35-70.7) . The duration of procedure was 154 min(88-287 min) with one conversion to open procedure in patient with left sided portal hypertension. Median length of stay was 2 days (2-8). BMI and % EBWL at 6months were 35 (26.48-52.34) and 50.8% ( -88%), respectively. At 1 year of follow-up, BMI and % EBWL were 36.99 (27- 50.9) and 53.9% ( 24.6- 100%), respectively. There were no mortality. The early postoperative morbidity was 10.3% (myocardial infarction, intra abdominal abscess without leak, proximal staple line leak, subdiaphragmatic abscess and empyema due to proximal gastric leak. All gastric suture line leaks occurred in male patients: 3 in subcardia area and one at the level of antrum. There were 4 re-admissions- 3 for gastric leak ( 2 early post operative and one after 6 months) and one for abscess without leak. 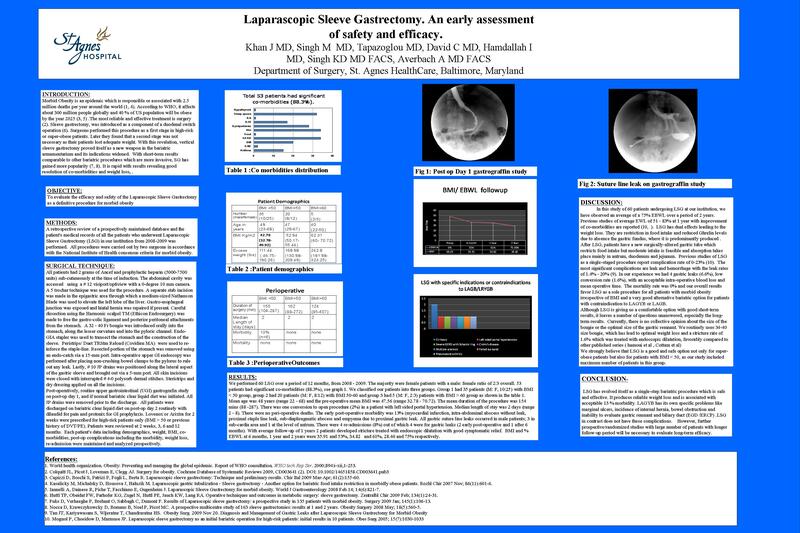 With average follow-up of 1 year two patients developed stricture treated with endoscopic dilatation. CONCLUSION: LSG while producing reliable weight loss at 1 year is only seemingly simple procedure and is associated with 10.3% morbidity. Risk of gastric suture line leak appears to be substantially higherin males with high BMI. Further studies with large number of patients and longer follow-up period will be necessary to evaluate long-term efficacy.